While our family were checking out the various recycling yards and op shops in our area the other day, my son adopted a poor little teddy bear he named Blinky. Charlie felt sorry for Blinky, and convinced that I could fix him, he brought the bear home. The result? 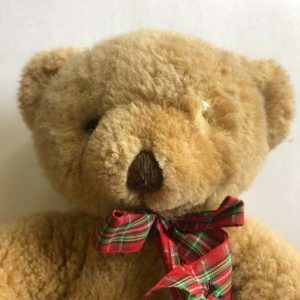 Please enjoy my new tutorial: How to replace a teddy bear’s eye. 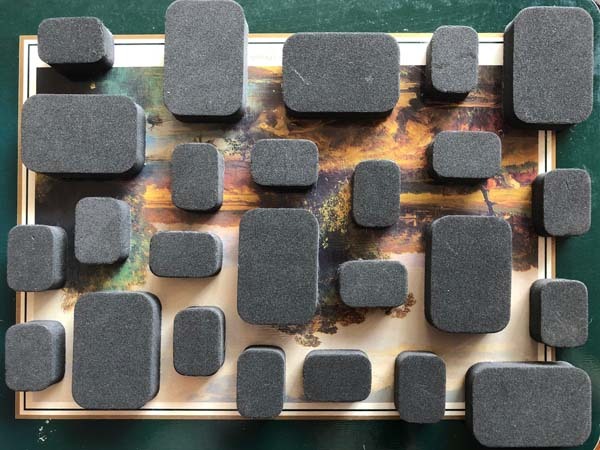 Yesterday we took a family trip to the recycling yard (as you do), and I found some boxes of sticky foam sponge shapes, that I assume were meant to be used as packaging somehow. 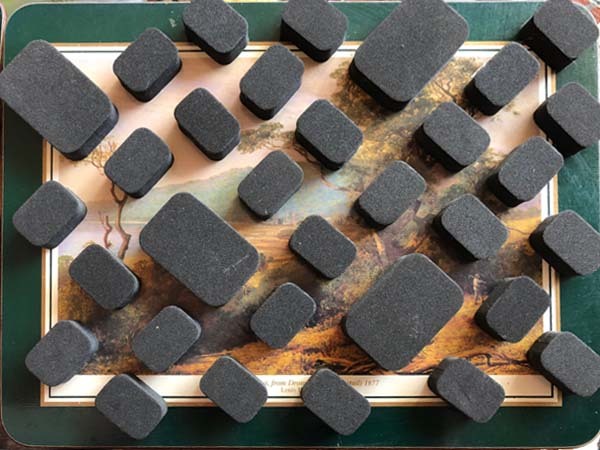 The type of foam reminded me of the kind used to make Art Foamies, so I stuck them onto three cork place-mats, and now I have a new set of printing blocks! (Above) This one was inspired by the Mid Century Modern school of design. I might carve some little flower and motif stamps to print over the top. Or maybe some fish. 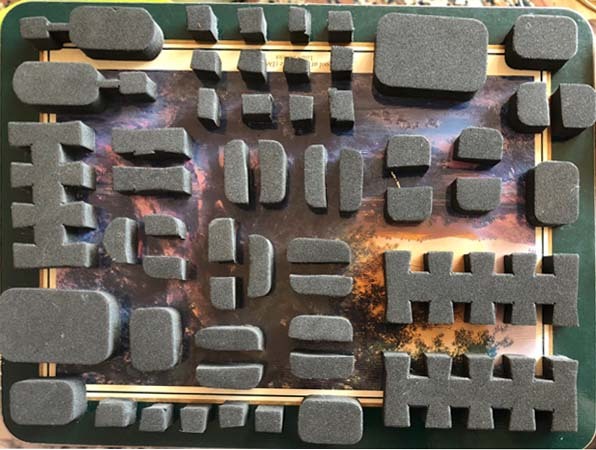 (Below) I decided to see what I could do with all of the pieces that had been cut up and the odd shapes. This block was inspired by the designs on the Pyrmont incinerator designed by Walter Burley Griffin in the 1930’s. I had the honour of seeing it shortly before it was demolished. The architectural detail was stunning even in the state of decay it was suffering in 1990. These are multi purpose plates. I can roll paint onto them using a foam brayer and print with them that way. I can sponge colours on for a multi-colour effect, or use them as texture plates with a gelli plate. I have so much experimenting to do! I think I’ll start with printing some fabric. I also found this little bonus in one of the pots of foam pieces. It looks like the previous owner had a similar idea to mine as they had made a little set of round stamps. Do you like printing on fabric or using gelli plates? Leave a comment with a link to your work becuase I’d love to take a look! 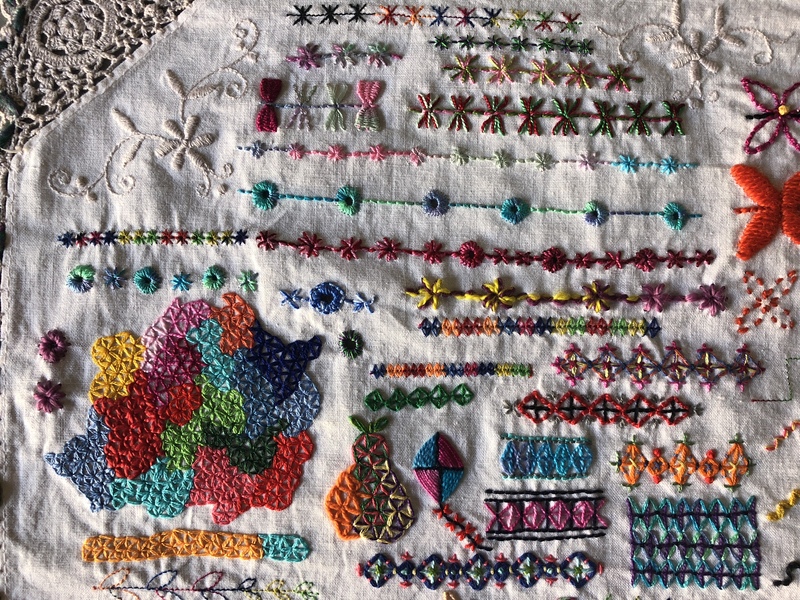 There are an almost infinite number of places to look for inspiration when it comes to designing hand embroidery and with the invention of the internet, we’ve never had access to more. The premise: pick a few stitches from your sewing machine. 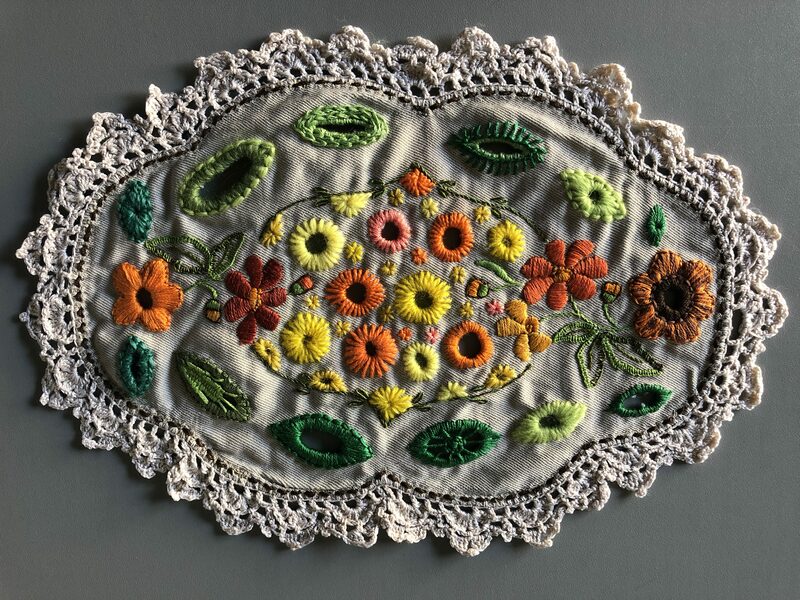 See what hand embroidery they inspire. I chose not only to replicate the stitches by hand, but also see what stitches might work with them if they were used together. I worked on an old worn out and slightly stained piece of vintage hand work, as I did with my found embroidery pieces in my previous post. 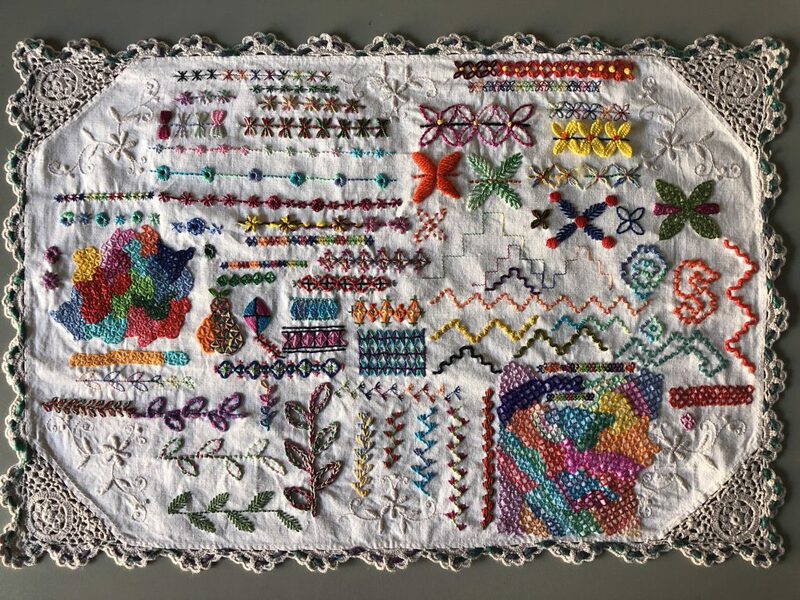 The completed sampler shows the eight machine stitches I chose and all the stitch variations they inspired. At the top of this photo you can see the machine stitch with asterisks were worked short and long, woven and eventually morphed into eyelets. The diamond stitch became several fancy borders before turning into a traditional triangular filling stitch. I also used the triangular filling stitch on the crossed petals on the right, along with woven detached picots, satin, fly chain and back stitch. I repeated the zig-zag stitch with different threads before trying it on several different shapes. The diamond border on the centre right became a small motif, border and large area of back stitched trellis. Back stitched trellis and the triangular filling stitch have become firm favourites of mine, along with eyelets. I’d happily embroider them everywhere! On the left you can see a machine stitched variation of feather stitch. I found that working it in feather stitch made it a bit sloppy unless worked very small, and my favourite two versions are those on the right. Finally, the leaf stitch was worked in both sizes offered by my sewing machine. I worked it in variations including detached chain and chain stitch, back stitch and fly stitch. To finish off the sampler, I threaded knitting wool along the crocheted edge to frame it. I highly recommend both working on old, worn embroidery and making a sampler inspired by machine stitches. 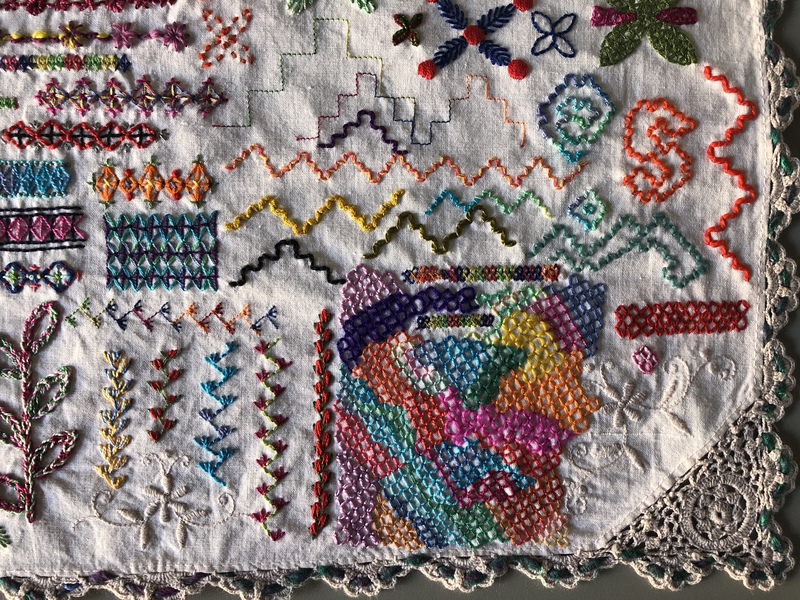 Even if your machine has only the most basic of zig-zags you could work a sampler with all sorts of variations by changing the length and width of your machine stitches and then seeing how many hand stitches they inspire. You can come up with some unexpected new hand stitches, and may even be inspired to use hand and machine stitching together. 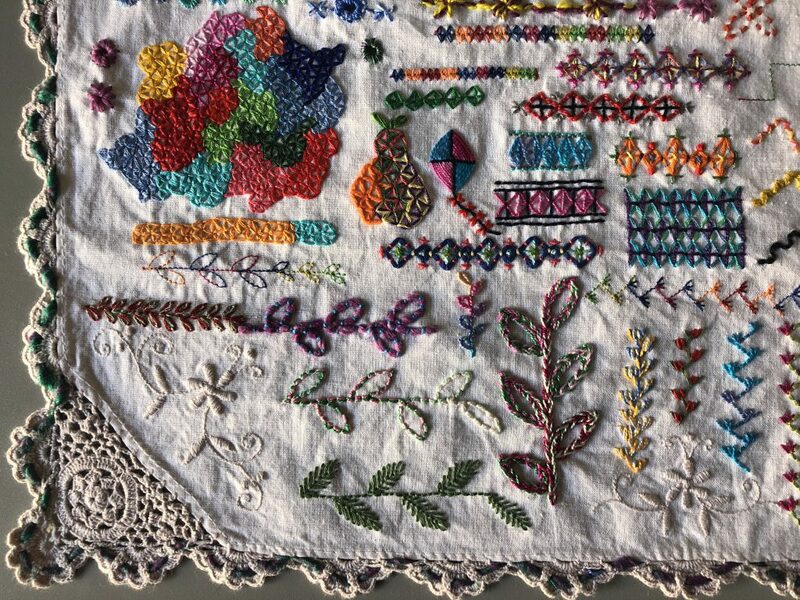 I am an avid collector of vintage embroideries, especially ones with interesting floral designs. Finished ones, unworked ones, worn out and stained ones, if the price is right they come home with me, usually from our local op shop/charity thrift store for fifty cents to a few dollars. Spectacular pieces go into my collection of pieces to use as they are, but I use the others as pieces of fabric to stitch on. Here are my two most recent pieces. 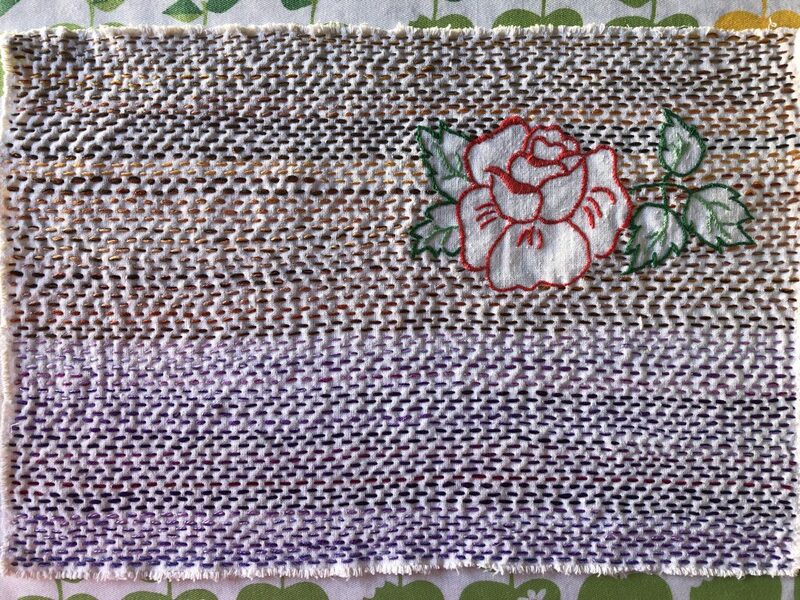 I loved the rose on this placemat but the stitching was quite worn, and it had a couple of cream coloured paint splotches that I didn’t notice until after I washed out the stains! I took some scrap threads and doubled them up to about the thickness of six strand floss and worked running stitch across the background to make the rose “pop” out from the background. I’m a big fan of running stitch! I tried to offset each row of stitching but didn’t worry if stitches were a little wonky. I also removed the crocheted lace edging so I can dye it and use it for something else. This piece will end up becoming part of another project. At the moment I think I’ll use it as part of a cover for one of my stitch sampler books, but who knows? Another damaged doily became this very simple modern eyelet sampler. Orange and green are my favourite colours but no amount of soaking would remove all of the rust and ink stains from this little mat. I decided I could either cover them or cut them out. Why not both? I used scraps of various orange and green threads and worked round eyelets in the centre, a flower at each end, and leaves on the top and bottom. (Click the photo to see a larger version). Since the stitching holding the crocheted edging was quite worn, I worked running stitch with dark brown through the holes, which frames the finished piece nicely, I think. I’d never worked eyelets before so this little fifty cent doily was both educational and fun to make. It’s small enough to fit in with my other samplers so it will probably get bound into one of my fabric books for future reference. I’m definitely going to stitch a lot more of the flowers like the orange and brown one on the right! 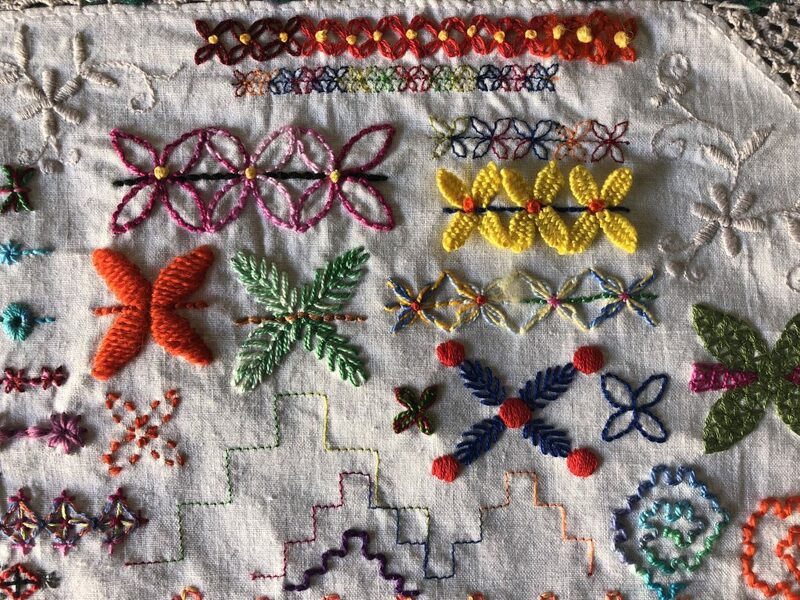 Instructions for working eyelets can be found here on the French Knots vintage embroidery website. I experimented with a few different stitches around the leaf shapes after working the satin stitch over the edge. Most are finished off with back stitch to tidy them up, but a couple have tiny satin stitch and rounds of chain and blanket stitch as decorative finished around the outside. I have another sampler worked on found embroidery to show you tomorrow, so please come back then. I’m quite excited by the way it turned out! New on Knitting-and.com today! 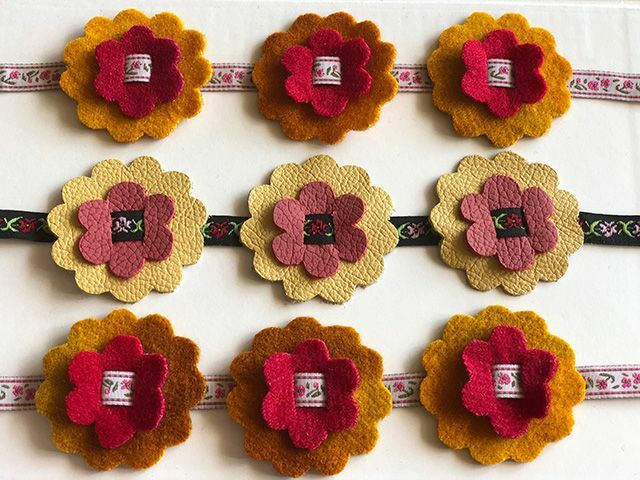 A new tutorial on making floral trim from ribbon and scrap fabrics. (Click on the link for the tutorial). You can make them out of anything that doesn’t fray, including felt, leather and fabrics bonded to iron on interfacing. I made mine from leather furnishing samples and the blankets that I dyed last year. My flower trims will be used on a fabric book in the near future so keep an eye out for them!